Pro Processor has the spices and mixes you need to create many different sausages. We have special ethnic mixes for practically any special interest group. There are special discounted prices for quantity purchases. You can buy packages for 25 lb. batches or 10 lbs. bulk for your own size batches. There's money to be made here! We believe these seasoning mixes are excellent as they are, but you can always add more pepper, mustard seed, cheese, jalapeno flakes or powder to make it your own special taste. This is the seasoning you need to make 25 lbs. of salami at home. 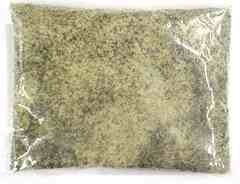 Each package also includes the 1 oz. of cure needed. Makes great salami to slice up and serve at parties or just watching the game on tv at home. This package will flavor 25 lbs. 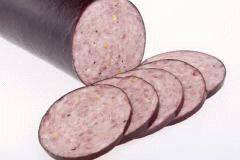 of meat to make a delicious summer sausage. It works well with added peppercorn, hi-temp cheese or mustard seed or all of the above. 1 oz. curing salt is included. Contains MSG. 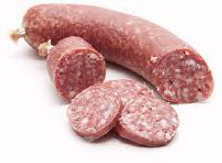 We also carry summer sausage casings. Cure for 25 lbs. of meat #632-026. This is the same delicious summer sausage seasoning but this larger package will flavor 100 lbs. of meat. Includes 4 oz. of curing salt. Contains MSG. This is the same delicious summer sausage seasoning but this 10 lb. box will flavor 285 lbs. of meat. The curing salt is NOT included and must be purchased separately. Contains MSG. 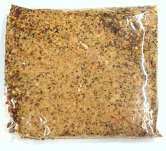 This pepperoni sausage seasoning mix makes 25 lbs. of pepperoni sausage. Great flavor for pizzas or for any of your favorite recipes. This package will flavor 25 lbs. of meat and includes the cure. 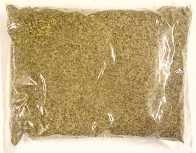 Use this seasoning mix for your favorite meats including venison, pork or beef. Make sausage like the ancestors did way back when! Add the perfect flavor to that wild hog! This package will season 25 lbs. of meat. It's one of our top selling sausage mixes! We adapted this mix from the venison sausage mix but designed for pure pork. 10% discount on orders of 24 or more! For you wild game processors! Add the perfect flavor to that wild hog! This 10 lb. box will season 285 lbs. of meat. It's one of our top selling sausage mixes! We adapted this mix from the venison sausage mix but designed for pure pork. Click here for traditional German sausage instructions. This package will flavor 25 lbs. of meat for a great sausage in the German tradition. Buy a case of 24 and SAVE $10.77! The package seasons 25 lbs. of meat. 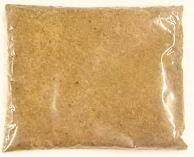 This seasoning is also known as kielbasa seasoning mix. Buy a case of 24 and SAVE $9.60! This box flavors 350 lbs of sausage. If you wish to make less 2.75 lbs. of mix flavors 100 lbs. of sausage. Click here for mild Italian sausage mixing instructions. This package will flavor 25 lbs. of meat. It makes the best sausage for your favorite Italian recipes. It can also be used to make breakfast sausage. Buy a case of 24 and SAVE $11.97! This package seasons 25 lbs. of meat. The same great mix but with heat. Buy a case of 24 and SAVE $13.20! This package will flavor 25 lbs. of meat. It is a big favorite of our deer hunters and deer processors. It has a very unique and flavorful taste that you will never forget. I often say that this makes a sausage that you don't have to put ketchup on. You can buy a case see item #632362. Buy a case of 24 and SAVE $8.37! This 10 lb. box flavors up to 400 lbs. of meat for delicious venison sausage. It is one of our best selling seasonings! You will need 1 lb. of curing salt if you wish to smoke your sausage. Simply order it extra and mix it in. We are unable to mix it in for you. Case of 24 will flavor up to 600 lbs. This is the same popular boudin seasoning but it is HOT. This package will flavor 25 lbs. of meat. Contains MSG. Buy a case of 6 and SAVE $6.59! This is the same popular boudin seasoning but it is HOT. This 5 lb. package will flavor 140 lbs. of meat. Contains MSG. Boudin, also known as boudan or boudain, is a south Louisiana tradition. It is made with pork, rice and seasonings and stuffed into links. You can also make various kinds of sausage with this mild seasoning including French, Belgian, German, Quebec, Acadian, Creole, Austrian and Cajun recipes. This flavorful mix is very popular. This package will flavor 25 lbs. of meat. Includes MSG. Same great seasoning but in a 5 lb. package. It will flavor 140 lbs. of meat. Contains MSG. Click here for chorizo sausage mixing instructions. This package flavors 25 lbs. of the traditional Mexican sausage. Chorizo can be eaten sliced in a sandwich, grilled, fried, or simmered in liquid including apple cider or other strong alcoholic beverage such as aguardiente. 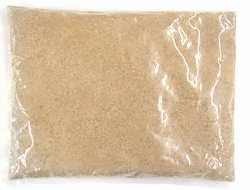 It also can be used as a partial replacement for ground (minced) beef or pork. Buy a case of 24 and SAVE $23.97! This package of seasoning will flavor 25 lbs. of meat. It's a great sausage mix that enhances the meat flavor without overwhelming it. Most Germanic/Czech families in this area use a recipe very similar to this for their basic sausage mix. Can be enhanced with various other spices such as mustard seed or peppercorn. This box of seasoning will flavor 500 lbs. of meat. If you want to make 100 lbs. of sausage use 2.5 lbs. of seasoning. This is a great sausage mix that enhances the meat flavor without overwhelming it. Most Germanic/Czech families in this area use a recipe very similar to this for their basic sausage mix. 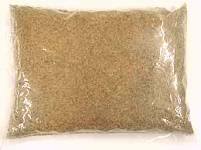 Can be enhanced with various other spices such as mustard seed or peppercorn. This is a delicious basic breakfast sausage seasoning mix. Add your favorite spices if you think you need them! Makes 25 lbs. of sausage. Buy a case of 24 and SAVE $8.62! This is the same delicious sausage mix but in a 10 lb. box! Makes 500 lbs. of sausage or use 2 lbs. of mix for 100 lbs. of sausage. This package makes 25 lbs. of delicious sausage and is a great basic mixture. Just add your favorite ingredients. Makes a great breakfast sausage patty. Buy a case of 24 and SAVE $8.85! This is the same delicious mix but in a 10 lb. box. It will season 500 lbs. of meat or use 2 lbs. of mix to make 100 lbs. of sausage. This package flavors 25 lbs. of traditional German knackwurst sausage. It is also known as knokwurst, knakwurst or nockwurst. Sausage Mix by Heinsohn's "Hot & Spicy"
This seasoning package flavors 25 lbs. of great sausage. Can be used for link or pan sausage. It's a little warm. This package will flavor 25 lbs of meat and includes the cure. Use to make those beek snack sticks that you can take on a road trip, hiking, camping or just watching your favorite game on tv. This spice contains jalapeno powder. Great to add that spicy touch. This package will flavor 25 lbs. of meat to make that signature andouille sausage. 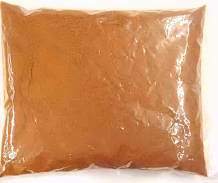 It is commonly used as an ingredient in making several classic Cajun dishes. It's signature smoky flavor can be found in etouffee, gumbo, and jambalaya. Andouille is best made with pecan or hickory chips and should be used with a cure. Contains MSG. Buy a case of 24 and SAVE $9.58! This package will flavor 25 lbs. of meat. It is perfect for that sweet tooth for morning breakfast! This package flavors 25 lbs. of one of the most famous of the German sausages. Easy driving distance from San Antonio, Dallas - Fort Worth, Corpus Christi, Austin, Waco and Houston, Texas. We are a one to two hours drive from these other fine Texas communities too: Seguin, Fredericksburg, Kerrville, New Braunfels, Flatonia, El Campo, Victoria, Needville, Hallettsville, Conroe, Schulenburg, Weimer, Huntsville, Sugarland, Pasadena, Rosenberg, Bellville, Fayetteville, Katy, College Station, Bastrop, Warrenton, Sealy, LaGrange, Brenham, Cypress, Wharton, Rosenberg and The Woodlands. Click here for a map to find us. Are you outside these Texas communities? No problem, just order online. ProProcessor is committed to saving you money on meat processing equipment and supplies. 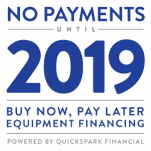 You can buy meat mixers, electric meat grinders, meat slicers, meat saws, bowl choppers, cutting tools, patty makers, meatball making machines, commercial vacuum sealers, tenderizers, tables and sinks for all your meat processing needs. We have everything you need for meat handling, game processing, meat curing, and jerky.